transgender – Can You Relate? 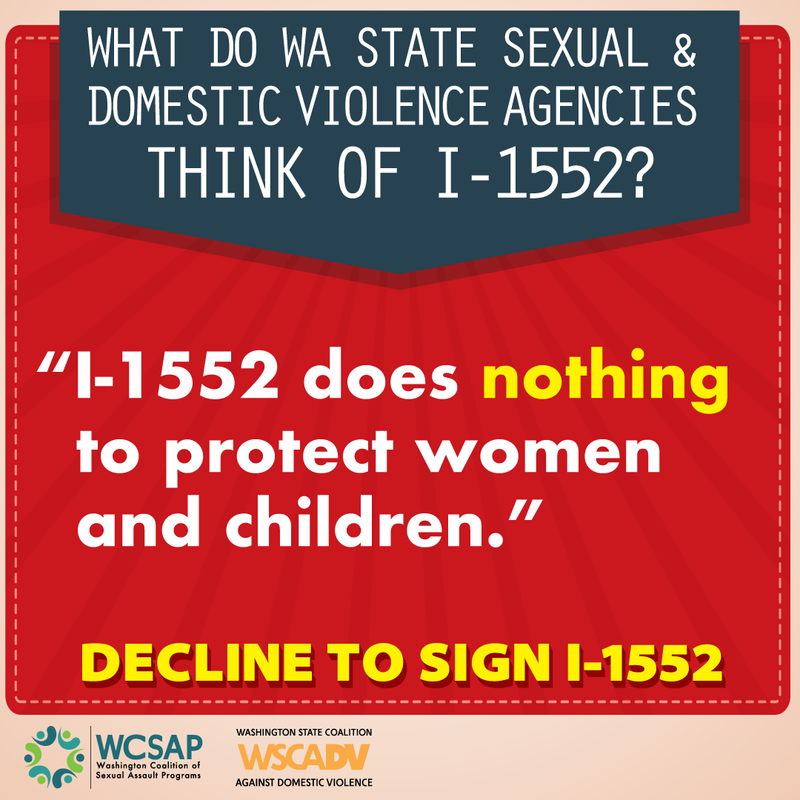 I-1552 is bad for survivors of sexual and domestic violence. This week kids across Washington State headed back to school. According to our state constitution, educating our children is the paramount duty of government. It is the greatest collective responsibility we share as a community. Of course, there is no lack of debate or dispute over what that duty requires. Washington State has been ordered into court on Sept 7th by the WA Supreme Court to answer questions about the ongoing impact of the McCleary Decision, which has been fining WA State $100,000 a day for over a year for not making significant progress on special education, teachers’ salaries and a host of school basics. Arguments over “teaching to the test” continue to brew. School bathrooms have taken center stage in the growing conversations and controversies over gender. The Department of Justice has pointed out the dangers of the “preschool to prison pipeline” where African American children, poor children and foster children disproportionately find public education not a path to stability and achievement, but a process of escalating surveillance and criminalized discipline that results in imprisonment rather than empowerment. And a recent study by the NW Network and the National Domestic Violence Hotline demonstrates that fear of mandatory reporting to police or CPS by reporters such as school teachers and counselors results in young people delaying or avoiding seeking help when they are experiencing harm. It can be easy to become overwhelmed by the storms that surround education. But, instead of turning away from the challenges that face our schools, let’s get educated about these challenges and the positions on education held by every candidate seeking office this fall. Let’s make sure we have all our kids’ backs as they head back to school. After 10 years on the books, Washington State’s law protecting transgender people from discrimination is under attack. And we’re not alone. Similar fights are playing out across the country over the recent wave of anti-trans legislation. Why now? It seems that for all these years, Americans were okay with trans people in public bathrooms, but only so long as they remained on the margins, in a legal limbo, with no rules laid down to clarify their right to be there. These so-called “bathroom bills” won’t keep transgender people out of public spaces. They simply shore up the status quo that makes trans lives illicit or invisible. Despite the ugly rhetoric, most of their supporters acknowledge that a trans person using the bathroom is not a threat to the person in the stall next to them. The only real threat is to the authority of the (previously unwritten) rules that force all of us to fit into rigid gender roles and punish us if we don’t. The current backlash is a signal that the transgender movement has achieved a profound cultural shift. Social acceptance of trans people has made room to acknowledge all kinds of gender expression and identities that don’t fit neatly into the categories defined by standard bathroom signs. The “bathroom bills” re-assert a clear dividing line between men and women. They lay down rules for which is which, and penalties for crossing that line. If you have been watching television for the past 20 years, you have witnessed the progression of cultural attitudes toward trans people, from freaky (trans people on Jerry Springer) to respectable (trans people on Oprah). And if you have not been watching, now is a good time to start. Trans people are asserting the right to be respected and freaky at the same time (and we have our own shows!). It’s not just state legislators anxious about this development. The trans community itself is grappling with the tension between “We’re here, we’re queer, get used to it!” and “We’re here, we’re totally normal, so nothing to worry about!” The trans women of I Am Cait represent the whole range. As Caitlyn Jenner is thrust into the role of transgender celebrity, Professor Jenny Boylan leads a crash course on everything she needs to know to represent the diverse community. Jenner sees no contradiction between her goals of winning broad acceptance for transgender rights and protecting her own substantial privilege through electing right wing conservatives. And then there’s gender outlaw Kate Bornstein, whose version of liberation is making the world safe for everyone living outside the lines. The conflict may be predictable, but the solidarity and commitment to hearing each other steals the show. Who would have thought reality television would bring us an exquisite model for approaching this essential conversation with realness, courage, and love?